He guzzled Diet Coke all day long. Fast food was a constant. The "three staples," in the words of one aide: Domino's, KFC, and McDonald's. Big Macs were served on silver trays in his private jet. Trump loves big steaks, preferably the ones served at his clubs. ... Trump snacks on original-flavored Lay's potato chips and vanilla-flavored Keebler Vienna Fingers. Says a former aide: "He used to love Oreos but he really did stop eating them once they moved [their plants] to Mexico." 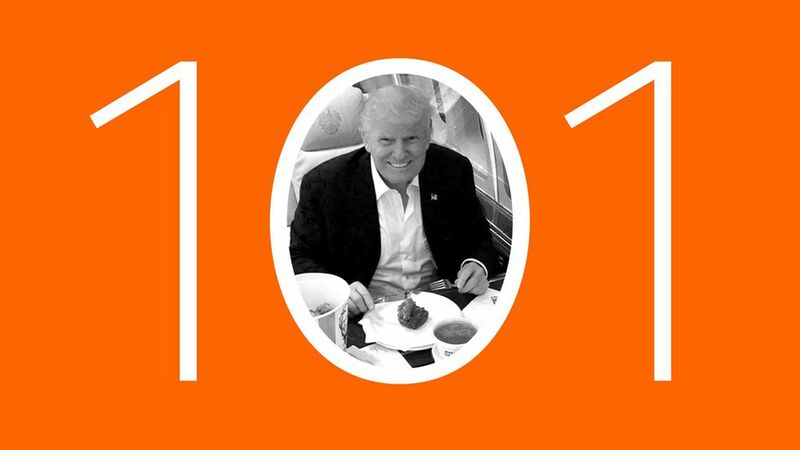 Read the whole thing, "Trump 101: he is definitely not a health nut." Sentence of the Day, from a N.Y. Times front-pager by Glenn Thrush and Maggie Haberman, "Trump and Staff Rethink Tactics After Stumbles": White House Chief of Staff Reince Priebus has "created a 10-point checklist for the release of any new initiatives that includes signoff from the communications department and the White House staff secretary, Robert Porter." In other words: A normal White House staffing process. Two Twitter accounts of Daniel John Sobieski, 68, "one of the nation's most prolific conservative voices ... tweet more than 1,000 times a day using 'schedulers' that work through stacks of his own pre-written posts in repetitive loops." "Researchers have documented the power of automation technology to magnify some points of view while drowning out others." "One research team found that 'highly automated accounts' supporting President Trump ... out-tweeted those supporting Democrat Hillary Clinton by a ratio of 5 to 1 in the final days before the vote." "This Twitter advantage had spillover effects, helping pro-Trump and anti-Clinton stories to trend online, making them more likely to find their way into Facebook feeds or Google's list of popular news stories." A turning point for fake news? Jim Rutenberg's N.Y. Times "Mediator" column says the organic response to Kellyanne Conway's "Bowling Green Massacre" gaffe appears to be "the first break in the 'fake news' clouds": "The same internet that enabled false stories to run unchecked through news feeds during the election year dispatched new white blood cells that attacked Ms. Conway's 'alternate facts.'" "Their most effective attack was traditional reporting, in many cases from news organizations that have doubled down on fact-checking, joined by newfangled memes that accentuate the truth. ... [S]ocial media and journalistic scrutiny aligned with comedy to right a wrong pretty definitively." Administration officials expect the travel-restrictions case to wind up at the Supreme Court, regardless of what the San Francisco-based 9th Circuit Court of Appeals does. That's risky: Trump's argument emphasizes its theory of presidential power, so even conservative justices could vote against him. But conservative radio host Hugh Hewitt, a lawyer and law professor, told me during our "Mondays with Mike" hit this morning that he thinks the White House has "a pretty easy case." The appeals court has fast-tracked the case, so the administration expects a decision early this week. The L.A. Times' longtime 9th-Circuit watcher, Maura Dolan, says the action begins today: "A brief from the two states that challenged the ban [Minnesota and state of Washington] will be due at 1 a.m. Pacific time Monday and the administration's response at 3 p.m. A panel ruling could come anytime after that — most likely within a week." Tech companies go a step further .... 97 companies, from Apple to Zynga, last night filed a legal brief in the 9th Circuit against Trump's immigration order, per Bloomberg: "The amicus brief ... emphasizes the importance of immigrants in the economy and society. The companies originally planned to file the brief later this coming week, but accelerated efforts over the weekend after other legal challenges to the order." "The participating technology companies include Airbnb Inc., Facebook Inc., Google, Intel Corp., Netflix Inc., Snap Inc. and Uber Technologies Inc. Companies beyond technology signed on as well, including Levi Strauss & Co. and yogurt maker Chobani." "But there was no demotion. As former State Department legal counsel John Bellinger pointed out on the Lawfare website, the Principals Committee was tasked with reporting to both the NSC and the Homeland Security Council. That meant it might take up some domestic issues, such as disaster relief, outside the purview of the intelligence community and military. ... [T]he George W. Bush administration had the same organization." Why this got traction: Jackson notes that the criticism stemmed partly from "the blizzard of executive orders issuing or leaking from the White House ... that officials have done little to explain to Cabinet agencies, much less the press. Then there is the already established proclivity of ... spokespersons to retail brazen untruths, at the apparent urging of the boss." ... predicting "tremendous job growth in this country." In a pretaped interview with Bill O'Reilly at the top of Hour 4 of Fox's 6½-hour pregame show (with more of the interview coming on Fox News' "The O'Reilly Factor" today and tomorrow), President Trump bragged about jobs: "Already I've turned it around – you see that. Ford has been phenomenal: They canceled the plan, they're building tremendous -- "
O'Reilly interjected: "Yeah, you intimidated them – they're afraid of you." Trump continued: "No -- General Motors is ... I don't know if they're afraid. No, no: They want to do what's right. ... "
O'Reilly: "Why didn't they do what was right in the past? They're afraid of you." Trump said: "Because the wrong people spoke to them. But -- they're going to do what's right and they're bringing jobs back to Michigan and Ohio ... and Pennsylvania and all the places that have lost the jobs. So that's already happening. I think you're going to see a tremendous job growth in this country." Pressed by O'Reilly at the end of the interview, Trump picked the Pats by 8: "I like Bob Kraft, I like Coach Belichick, and Tom Brady's my friend. ... I know they're taking a lot of heat [for being friends]. ... I think the other team is fantastic though. No, I think it's a fantastic team, turned out to be a good quarterback. ... But, you know, you have to stick up for your friends, right?" Trump spoke yesterday with NATO Secretary-General Jens Stoltenberg and agreed to attend a NATO leaders' meeting in late May in Brussels, where he'll have to live down his "obsolete" gibe. Trump spoke with Italian Prime Minister Paolo Gentiloni on Saturday and promised to attend a late-May summit of G-7 industrial nations in Taormina, Italy. Trump accepted the invitation of German Chancellor Angela Merkel to the G-20 economic summit in Hamburg, Germany, in early July. Trump accepted an invitation from Queen Elizabeth II for a state visit, expected this summer. Japanese Prime Minister Shinzo Abe will be at the White House on Friday. Israeli Prime Minister Benjamin Netanyahu follows on Feb. 15. The White House telegraphed a February visit by Canadian Prime Minister Justin Trudeau, but has yet to announce a date. "The $100 Billion Reason Investors Loved Trump's Bank Order": A Wall Street Journal front-pager reveals: "The six biggest U.S. banks could potentially return more than $100 billion in capital to investors over time through dividends and share buybacks if the Trump administration succeeds in a push to loosen bank regulation." "Super Bowl ads go political in a big way" -- AP's Mae Anderson: "Airbnb touted inclusiveness with an ad showing faces of different ethnicities and the copy: 'We all belong. The world is more beautiful the more you accept.' Coca-Cola aired a previously run ad during the pregame show in which people sing 'America the Beautiful' in different languages. And Budweiser ran a 60-second spot chronicling co-founder Adolphus Busch's migration from Germany to St. Louis in 1857, prompting some critics to start a boycott campaign on Twitter." See all the ads on one page at YouTube.